Service-learning provides opportunities for adolescents to foster leadership skills, learn about those in different social circumstances, and enhance civic engagement. 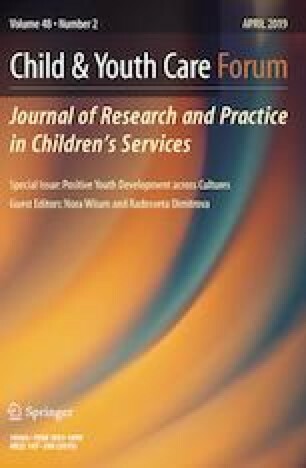 This pilot study described the implementation and evaluation of a service-learning project to train adolescents as coaches to teach social and emotional learning to elementary children. Reflection journals were used to document adolescent perceptions of the experience. Twenty-nine female and 16 male high school students participated. Adolescents delivered lessons focusing on emotional expression, learning emotions, and interpersonal problem solving. Adolescents used journals to reflect on their experiences. Coders used qualitative methods to analyze themes in adolescents’ answers to journal questions. Study findings indicated that several of the adolescents gained leadership and teaching skills, learned about children’s lives, and reported personal growth. Relatively more males described being in a teaching role as difficult, and they may require more support during teaching experiences. Keeping children focused and on-task was difficult for some students. However, adolescents reported feeling inspired by participating in the program and their positive influence as mentors for children. Adolescents understood the impact of poverty on children’s lives and some felt inspired and more willing to engage in future service. Adolescents were a valuable workforce as teachers for social and emotional skills for children. This was a summer program, and leaders need to continue to search for ways to incorporate similar character education programming during the school year. Future research should focus on assessment of change in children’s behaviors and future civic engagement of adolescents. The authors would like to thank the Mayerson Foundation Service-Learning Program, the high school student volunteers, and the children who participated. Billig, S. (2000). Research on K-12 school-based service-learning: The evidence builds. School K-12. Paper 3. http://digitalcommons.unomaha.edu/slcek12/3. Nabors, L., Welker, K., & Faller, S. E. (2018). Impact of service learning: High school students as health coaches for children. Journal of Community Engagement and Scholarship, 10(2), 95–105. Published online at: http://jces.ua.edu/jces-volume-10-no-2/. Reissman, F. (1965). The “Helper” therapy principle. Social Work, 10(2), 27–32. https://www.jstor.org/stable/23708219.